Known Relatives: None. Demonicus' other creations might be considered his brethren, and Dr. Demonicus and Maur-Konn were their creators. Powers/Abilities: The Hand of Five was an immense creature, roughly comparable in size to one of the Shogun Warriors, who were about 100' tall (If I remember correctly). It was in the form of an immense hand, with powerful jets (or rockets) at the palm, enabling it to fly at great speeds. Each digit was patterned after a serpent (or dragon)'s head; all five fingers could be discharged from their knuckle setting, and each could generate rocket propulsion from its base. The fingers could breathe fire, and they could also extrude weapons from the metal bands which were both "necks" and "finger-joints" to the serpent-digits. Some fired missiles or energy blasts, and at least one of them could generate giant buzz saws on each side of its base; these buzz saws could also be launched at a target. Certain trauma to the palm could cause it to forcibly discharge or reattach the digits. 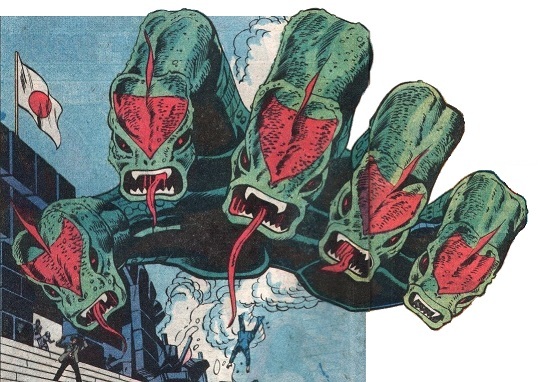 Dr. Demonicus created Cerberus, the Hand of Five, and the Starchild via combinations of genetic manipulation and robotics (from Maur-Konnn's designs), further mutating them with cosmic radiation from his own space station beyond Earth's moon. (Shogun Warriors#9 (fb) - BTS) - Demonicus sent the Hand of Five from his base towards Earth. (Shogun Warriors#9) - The Hand of Five approached the Tokyo courthouse in which Genji Odashu was being tried for treason. As Genji discovered the creature, the Followers warned her of its danger and prepared to send Combatra to her. (Shogun Warriors#10) - The Followers of Light transported Comatra to Genji to help combat the monstrous creature, but the inert robot was quickly punched to the ground by the Hand, nearly crushing Genji who had tried to enter it. Still, she managed to enter its shimmer-tube and be pulled into her Shogun Warrior. The Hand tried to punch straight through Combatra before she could right it, but Genji instead split her Shogun into its five component modules, and the Hand smashed a deep crater into the ground instead. The palm then sent off its five digits to assault Combatra's components, and one targeted Kosei Ono before Genji saved him. After a struggle with the components, the digits rejoined the hovering palm, and Genji re-merged Combatra's components to face it. (Shogun Warriors#11) - The Japanese military arrived and attacked the Hand, and Genji prepared to protect them from its retaliation. However, the Hand instead grabbed Combatra in its grip, with each digit belching flame onto the Shogun. With a concentrated blast of jet pressure, Combatra knocked the Hand to the ground, but when the soldiers, thinking it damaged, assaulted it, it turned on them, easily overpowering them. Combatra pulled the Hand from the ground and hurled it across the city, and when the Hand came flying back at her, Genji split Combatra into its components, which dodged the assault. The components then blasted the Hand in unison, causing it to discharge the fingers. After further struggle against the individual digits, in which one of Genji's component's engines was destroyed, Genji then directed the Centrons to simultaneously blast the palm's empty knuckles. This assault triggered the digits to return to their ports, but then the Hand took off at hyperspeed, faster than Combatra could follow. (Shogun Warriors#13 (fb) - BTS) - The Hand of Five returned to Demonicus' space station. (Shogun Warriors#11 - BTS) - From his orbiting base, Demonicus launched an immense meteor at Earth, and it was detected by the Followers of Light. (Shogun Warriors#12 - BTS) - The three Shogun Warriors' pilots, guided by the Followers of Light, flew into space and destroyed the meteor, after which they discovered Demonicus' space station near the moon. Demonicus blasted the three robots as they approached, causing Dangard Ace to crash on the moon, while Combatra and Raydeen were sent careening past the moon. Demonicus' men captured Dangard Ace. (Shogun Warriors#13) - Combatra and Raydeen used an asteroid belt to reverse their course, heading back to Demonicus' base, while Savage blew up one of Dangard Ace's power packs, causing Demonicus' agents to assume the robot to be nonfunctional, breaking free from them when they relaxed their restraints. Dangard Ace destroyed the weapon which had struck them before, allowing the other two to join him inside Demonicus' base. After fighting a batch of giant dinosaur-like mutates/creations, the Warriors entered a chamber containing Cerberus, the Hand of Five, and the Starchild. Demonicus then warned them that he had activated an electro-magnetic beam pulling another asteroid at Earth, and that Earth would be destroyed if they couldn't defeat his monsters AND deactivate the device within the hour. (Shogun Warriors#14) - Cerberus, the Hand of Five, and the Starchild attacked the Shogun Warriors, who were overcome by doubts about their ability to deal with the multiple threats against both they and Earth. 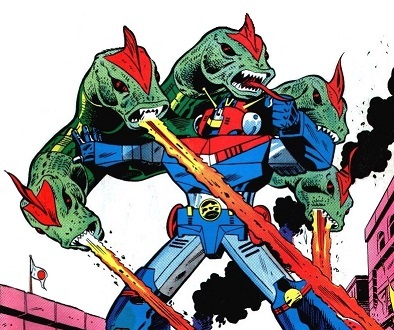 Demonicus, meanwhile, wished to kill the human operators and add the Shogun Warriors to his giant monsters which would aid him in conquering Earth once it had suffered cataclysmic devastation from the asteroid collision. However, Dr. Tambura of the Followers of Light proved able to rouse them out of their funk, causing them to fight back against their attackers. Following his instructions, the three pilots donned cybernetic helmets that linked their three human minds and channeled their very beings into the robots. The combined and coordinated efforts of Dangard Ace and Combatra quickly destroyed the Starchild. The Shoguns destroyed Demonicus' timer device and then pushed the criminal's space station into the approaching asteroid's path, destroying both. Comments: Created by Bill Mantlo, Herb Trimpe, and Mike Esposito. Suspension of disbelief at its greatest. There was an asteroid headed straight at Earth which would have caused worldwide devastation. 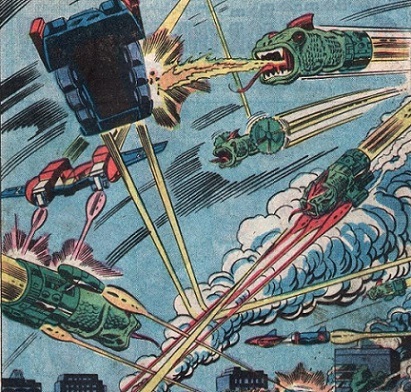 The three Shogun Warriors flew into space and blocked its path just outside of Earth's atmosphere. The asteroid struck the three of them and shattered into fragments small enough to burn up in the atmosphere. Yeah, right...must have had those inertial dampeners going at maximum power. I didn't like the way each of the monsters seemed virtually indestructible when facing the single warriors, yet they each fell so quickly against the team. It seemed too easy to me. There was no mention of Demonicus' Lifestone being part of the process that empowered the Hand of Five or the other two, or the "Dinosoids," but I would ASSume it to be involved unless stated otherwise somewhere.